I know everyone knows about the 7.0 earthquake that struck the nation of Haiti this week. I wasn't planning on posting about this, but after seeing the images on MSNBC, I felt led to try and help. We don't really have any money to give right now, so I thought there was nothing I could do. But, after reading on Crystal's site, I decided I could help. 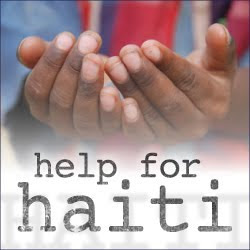 She and her husband are giving $10 for every person who links a post to her blog about how they are personally helping the people of Haiti. That is so generous of them! When I told my son and husband about being able to donate their swagbucks, they both told me to donate all the swagbucks that are in their accounts. It was then that I felt so selfish! I was planning on only donating a portion of my swagbucks, as I was going to trade some in for Amazon gift cards today. I decided if my son and husband could give so freely, I should too! So I am donating all 102 of my swagbucks. My son gave his 29 up and my husband gave all 39 of his. So, we are donating 170 total. I know it's not much, but every little bit helps. If you want to see how other bloggers are helping visit Money Saving Mom. A very sad situation--but God is in control. Thanks for all the great information--and yes, every little bit can help.